So, today I had a little time, or let's just say MADE a little time to play along this week's JustRite Stampers Challenge, which was a sketch, and I love sketches, so of course I had to play! I pulled out my Kaleidoscope set, which I really love and my Birthday Sentiments set and used some gorgeous My Minds Eye papers to go with them and some dictionary pages. 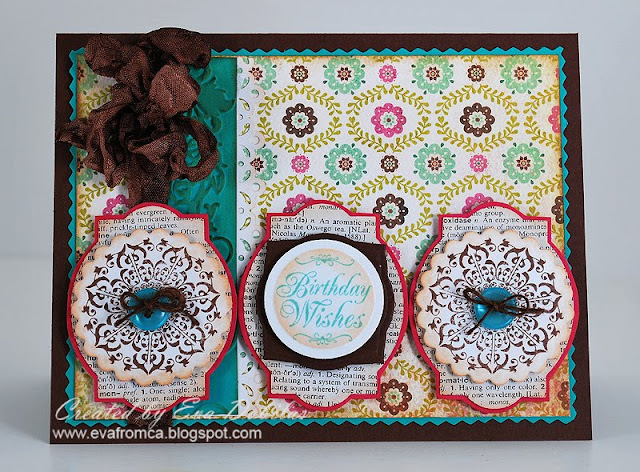 Also used the new and my new favorite Scrap-mart Exclusive Spellbinder dies called Ovalsquare label. I can't seem to stop creating with it, I really LOVE this new shape and it was perfect for this sketch! Anyway, here is my little card. Well, hope you like it....tomorrow I will be back with an Ippity card that uses the same paper combo...I guess it makes me happy....hehehe.